I proposed two more serious painting ideas based on work I did in undergrad and, as a throwaway third idea, proposed making a series of stuffed monsters based on doodles from my sketchbook. When I presented my ideas to the class, everyone took the monster idea more seriously than I expected. The next step was to figure out how to make them. I knew how to knit [or at least how to knit hats] and I knew some things about felting so I decided to try to knit monsters. The first attempt was, well, a learning experience. I named him Morton. I didn't have much of a plan for the eyes and teeth. My first attempts at eyes were felted balls of white yarn with push pins for the black part. The teeth were cut up pieces of clear plastic packaging that I used Elmer's glue to attach. At first Morton only had one arm and I just tied knots to make fingers. "Albee" was the first monster I knit that had two points. She still remains as part of my collection. The bigger brown button is from a sweater I used to wear all the time. I got an A in the class and when it ended, monsters crept into my other class projects. I used my monsters to illustrate a presentation on how to teach Art History [there was a cute rhyming story that went with it!] and to illustrate an artist book on why I wanted to be an Art Teacher. 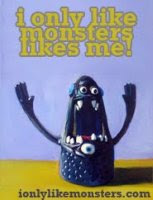 Monsters snuck into my paintings and drawings too. Since then monsters have evolved. I wrote out a pattern once, but mostly I work through trial and error. Some of my newer monsters have tentacles, some have tails and some have ears. I've made monsters to resemble a woman's pets and even a monster with antlers. It's fun to look back on my first attempts at monster making. They have changed so much! I throughly appreaciate everyone who has encouraged me along the way and supported my work! You all keep me inspired to create new and different monster designs!